Imagine having this beautiful exotic bird at your backyard feeder on a regular basis. One wild parakeet is a joy to watch. Two are nice, too. But how many constitute a nuisance? Rose-ringed parakeets (Psittacula krameri) are native to Asia and Africa and popular as pets in Europe, especially because they can mimic the human voice. 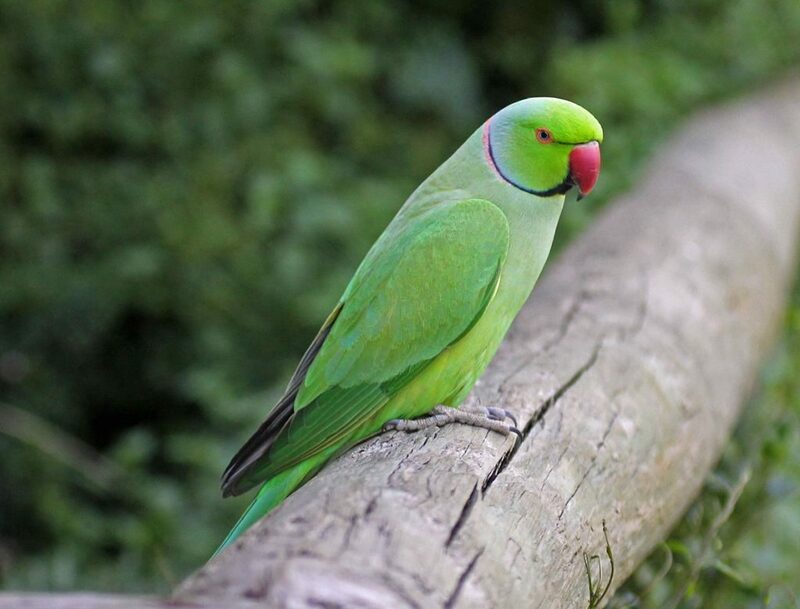 However escaped rose-ringed parakeets are now feral in many European cities and the seventh most numerous bird in London gardens (backyards). 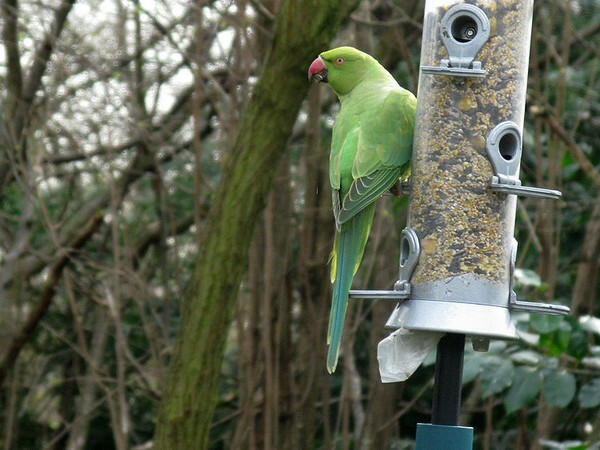 Counts conducted a decade ago put Britain’s feral parakeet population at 30,000 birds. In large flocks the parakeets are noisy and hungry, even voracious. They shout everywhere they go. “Rose-ringed Parakeet (Psittacula krameri)” from xeno-canto by Timo Tschentscher. Genre: Psittacidae. Ironically, the birds have reached two tipping points. Their population is increasing in urban Europe but declining in their homeland, India, where they’re trapped for the pet trade. How many is too many in Europe? How few is too few in the wild? Read more about the U.K. population at CBC news and on the RSBP website. p.s. The bird pictured at the feeder is female and not nearly as colorful as the male, below. The males have rosy rings on their necks. sorry, don’t know how to make a ‘link’ on this comment thread. — I was wondering if the Chicago birds were the same parakeets as in your post, apparently not.